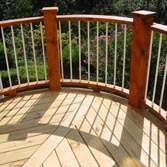 Reviews | Innovative Woodworks' customers write about our decks, porches, arbors, gazebos, and a whole lot more. 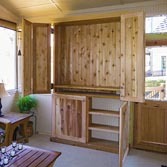 Some of our customers have taken the time to tell us about their Innovative Woodworks experience. With our sincere appreciation we present them here. If you would like to submit a review please visit our Contact page HERE. We had innovative build our pergola over our hot tub. The pergola is attached to the house and extends out 16 feet on our deck. The detail is amazing and the quality is outstanding. 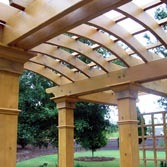 The pergola is made from cedar and looks like it could last 100 years. I just wish I could attach pictures. Will call them again for our next project. Wow, this company is good. App. 3 months ago we received 4 bids for a new front porch. Innovative came in the 2nd lowest and there was something I liked about them. They use superior products i.e. western red cedar for pergolas. 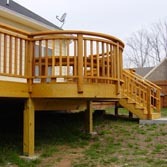 Installation was quick, clean-up was great, and follow ups on our new deck have been numerous. Excellent company. One of the best I've had the pleasure of dealing with. Ask for Pete McGuire...great guy. 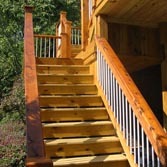 I hired Innovative Woodworks to build a deck on my townhouse. They understood exactly what my idea was. The crew built my deck in 1 day. They were professional and pleasant to deal with. I was extremely impressed. He provided me with his insurance cert, better business bureau rating, etc. without me even having to ask for it. I would highly recommend Innovative Woodworks. You don't have to worry about upfront deposit or wondering whether this contractor is going to show up or go out of business. What a group of friendly and talented people! From our initial first meeting to the completion of our patio extension and arbor, we could not have been more pleased. The entire project was completed without a hitch and far exceeded our expectations. A TOTAL CLASS ACT!!! Terrific, Clean and Very Fast!! Innovative Woodworks built our screened in porch. They were done within 3 weeks! Our porch is wonderful, with an outdoor fireplace and built in grill. They were great with coordinating everything and making it happen so fast. I highly recommend this very nice group of people. We were so impressed! 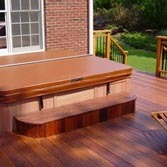 Innovative Woodworks did an excellent job on my decks. The front deck was especially difficult. I had a design in mind that would allow a wheelchair to get up to the front door without a ramp. I explained it to to the sales rep and the crew built it to my specifications. My son uses a wheelchair and he has been very happy with the results. Innovative Woodworks was absolutely amazing. He came to my home, walked us through the process, designed the deck by hand drawing and gave us great advice on how to make the deck better. The gentlemen who did the work were courteous, helpful, knowledgeable and very skilled. They built our screened porch and deck addition with basically 2 individuals. The ceiling of the screened porch is 15" high. The tiled floor in the porch was a GREAT feature. They finished in less than 3 weeks and the job site was left in immaculate condition. They were also timely in completing the punch work. I highly recommend them to everyone. You will not be disappointed. We had enlarged our deck shortly after moving in back in 2001 and installed a privacy, lattice fence which, quite frankly, sucked to say the least. After consulting with the owner of this business, we contracted with him to resurface the flooring, remove the privacy fence, install dry-under the deck over a patio and replace the builders-grade railings all over our property. We were very satisfied with the results. Innovative utilizes arc shapes and tremendously enhanced the finished job. All work was performed well within the designated time and the workers were extremely friendly and tireless. We recommend this contractor to anyone seeking this type of service. We would like to take this opportunity to thank all our customers for their wonderful comments. Although yours may not be listed here please know that each is appreciated and means a great deal to everyone at Innovative Woodworks. We realize you have numerous choices in our industry and we appreciate the opportunity to show you why our customers become repeat customers. Call us for your no-obligation estimate. You'll be glad you did.